Hello friends! 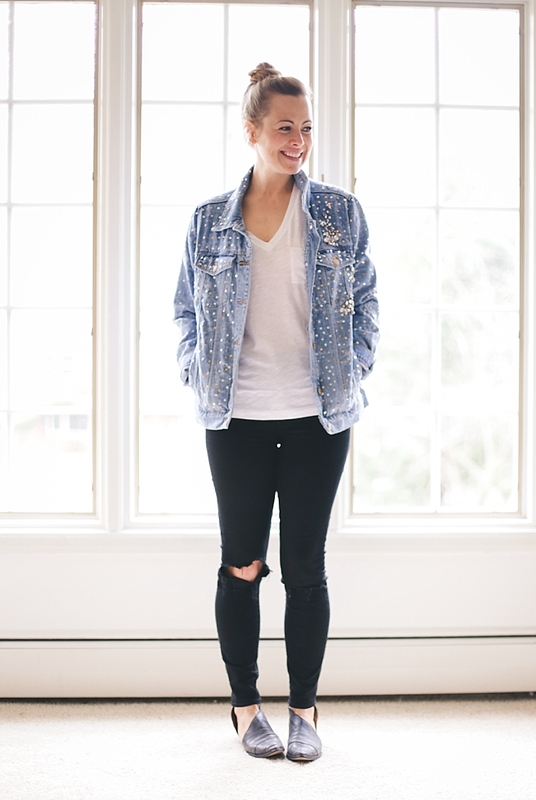 Today we have more of my casual faves, distressed denim and relaxed tees. This is the most basic I get, really! 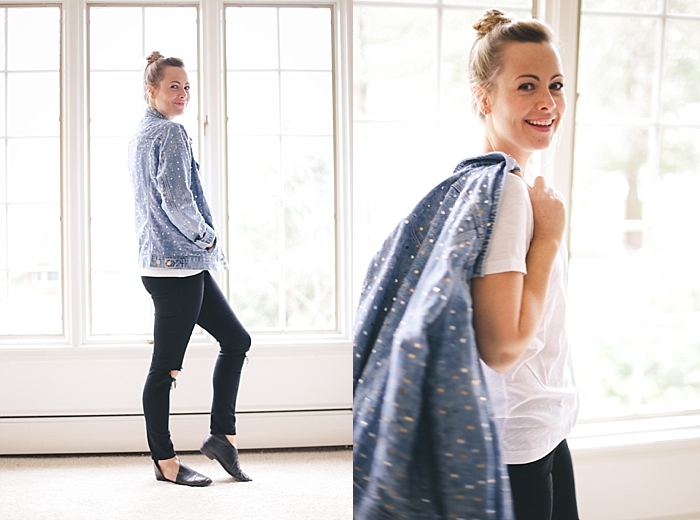 And I'm not exaggerating when I say I live in my denim; this pair is a prime example of that. I have 3 favorites and I tend to stick to those for 6 days of the week. One on and one off, then repeat. So for a stylist this is fairly unextraordinary, but I live in Green Bay and I have 4 kids so I really don't get much excitement in my everyday, at least the sort that allows for occasions to "dress up". For myself, this is very much due to the weather here and the fact that we have to layer much of the year. But as soon as the sun warms us up to bare shoulders and legs, these jeans will be replaced by dresses, every day. Cannot wait for that! In the meantime, these jeans are la-la-lovely. I wear a lot of my husband's tees cause I love the looser fit with skinny jeans. These Madewell tees are perfect too and feel a little more feminine than the guy's stuff, namely with that lower V neckline and slimmer sleeves. 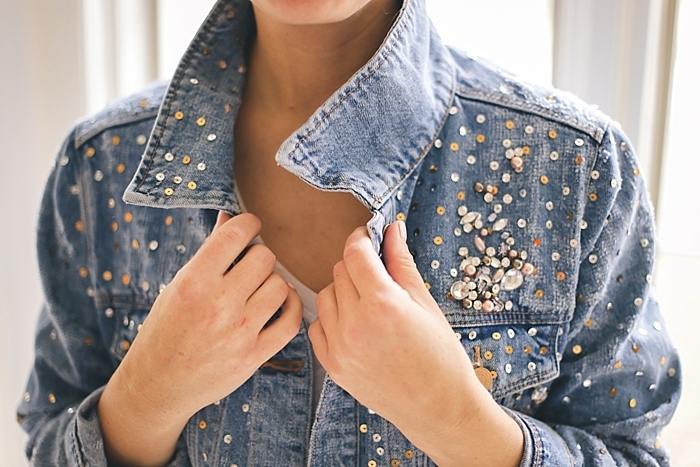 And then there's this denim jacket. Ahhhhhhh, it's a beauty. After making fun of the early 2000's fashion faux pas yesterday (that I'm now happily wearing again - figures) and then going off on a tiny tangent about leggings (that I think are exclusively okay for working out ladies and are sooooo inappropriate outside of the gym or studio. They are the least flattering thing a women can possibly wear. I'm dying here!). Now deep breath, and let me draw your attention to the oversized fit and rhinestoned goodness of this very 80's inspired jacket. YAS!!! I know, one day I'll be wearing leggings again and saying they're cool right? Oh boy.